What's better than having a web site that can sell for you 24 hours a day? One that updates itself with your current inventory. The Atrex eCommerce Import/Export utility is an easy to use interface between your Atrex database and your Zen Cart shopping cart. This utility allows you to automatically push the inventory information stored in your Atrex database as well as pull orders from your web site and import them directly into Atrex for processing. Why Zen Cart? Zen Cart has been a standard shopping cart for a large number of hosting companies for a long time. Many shared hosts have automated methods for installing the Zen Cart package for you. If you host your own site, you can download Zen Cart from the Zen Cart web site for free. And did we mention that Zen Cart is open source so you can use it for free. Of course you can also optionally contribute to the continued development of the package, which we strongly suggest. Supports Zen Cart 1.3x and 1.5x. Quick and easy installation. Most new installations can be up and running with the standard Zen Cart package in less than an hour. Inventory updates and order retrieval can be performed automatically. Inventory updates can be as often as every hour or as infrequent as once a day. Only populates your shopping cart with products with the items that you specify. Includes intelligent updates for the inventory item images to reduce bandwidth usage. Works with both in-house and hosted shopping cart installations. Matches existing customers by email address to reduce duplicate customers. 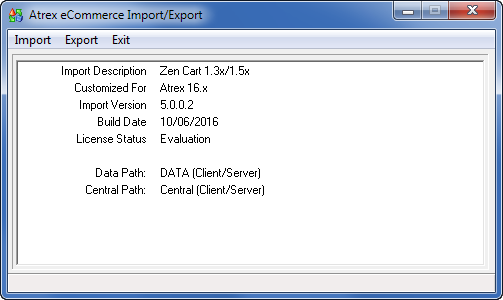 Try the Atrex eCommerce Import/Export utility for Zen Cart today. A fully functional evaluation copy of this program is available from our downloads page. The Atrex /eCommerce utility is licensed on a quarterly, semi-annual, or annual subscription basis on a per-company location basis. Your subscriptions includes unlimited use of the utility within one company location as defined by a unique Atrex serial number, all updates released within your subscription period, and support via email or community forum for the components supplied by Millennium Software, Inc. The subscription does NOT include support for the installation, maintenance, or modification of Zen Cart, or your web site. **Prices listed are in US Dollars. We strive to deliver the highest quality software and support that exceeds the expectations of our customers, at a reasonable price. Millennium Software respects your right to privacy. © Copyright Millennium Software, Inc. All Rights Reserved.